Sanding a wood door is best achieved with two different sanders. A hand-held belt sander should be used for the initial surface removal, and then a palm sander should be used for a quality finish. The sandpaper you use at each stage of the job is important, as is your technique. Sand your doors well before you refinish them. Load the belt sander with sandpaper. 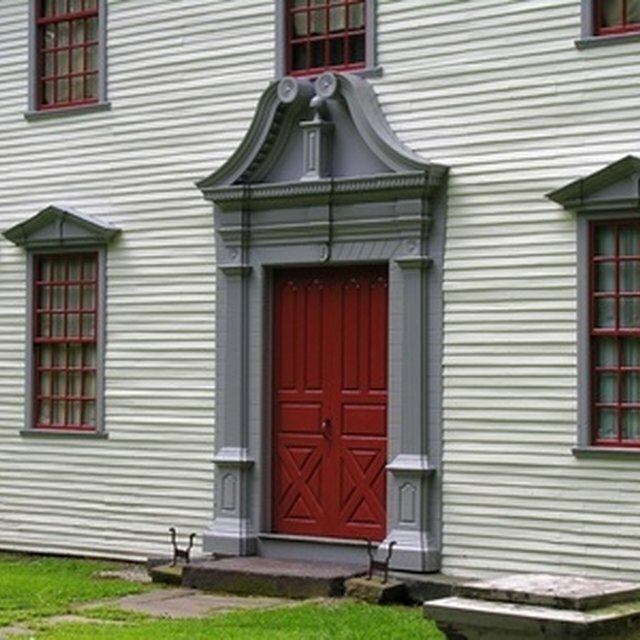 Heavily painted and rough-hewn doors need very coarse 60-grit or less sandpaper. Use the belt sander to remove the bulk of the surface. Run the belt sander over the door a few times, but don't try to get a finished result at this stage. Just remove paint, splinters and the like. Load the palm sander with sandpaper. Doors that have never been planed or that you have sanded with the belt sander will use an 80- to 100-grit sandpaper. Doors that have been planed will use 120 to 150. Apply uniform pressure with the palm sander, and use the tips or edges of the sanding sheet for moldings. Remove the sander from the door periodically if it heats up. Wipe the door down with a damp sponge when you're done. Then apply a thin coat of paint or varnish to the door. When the paint or varnish has dried, go over the door with the palm sander, using 180-220 grit sandpaper. Palm sand again with 240 or more grit for the final finish.